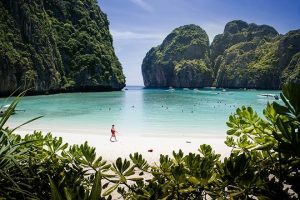 Krabi (Thailand) – May 19, 2018 (travelindex.com) – Thailand’s Department of National Parks, Wildlife and Plant Conservation (DNP) has announced that Maya Bay in Hat Noppharat Thara-Mu Ko Phi Phi National Park will not allow visitors during a much needed four-month rejuvenation period from 1 June to 30 September, 2018. Temporary closings of natural attractions are not new to Thailand. Each year, the DNP closes several national parks for a period to allow for ecological recovery time. Depending on weather and park conditions, dates vary as the closures are often due to extreme weather, especially during the rainy annual monsoon that may create unsafe conditions.